These sessions provide many opportunities for children to display the ‘effective learning characteristics’ outlined in the EYFS Handbook 2017 – playing and exploring, active learning, creating and thinking critically. We can also adapt many of our Key Stage 1 and 2 sessions for EYFS. *This session is available April-July only. Children explore colours, patterns and textures in nature, and are inspired by the forest around them to create natural artworks and decorations. Book two complementary sessions, exploring the changing seasons at Wild Place: Visit us in autumn/winter to discover how wildlife survives cold weather, then return in spring as the woods and meadows come to life. See our new seasonal visit discount for more information! Explore our new Forest Camp and take part in a variety of activities designed to develop confidence, teamwork and physical skills. Activities can tie into literacy using stories and fairytales you’re reading together, help develop communication, or explore the senses… just let us know your objectives! Children enjoy an enchanting wildlife-themed story outdoors or in, then use it as inspiration to explore the woodland and create wild works of art or an animal habitat. 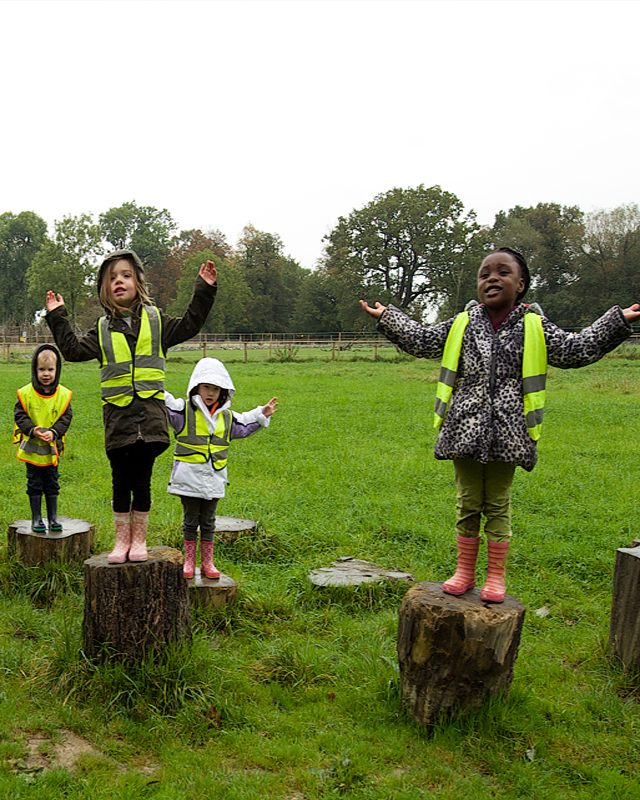 A classic story inspires learning about woodland animals, fun outdoor games such as find-the-bear and finally a teddy bears’ picnic on our beautiful Tower Meadow. Please ask children to bring their teddies and their usual snack for the picnic. *This session is available from April to July only. Get festive at Wild Place this Christmas and join us for the enchanting tale of Stick Man as he journeys through the changing seasons, meet a real ‘stick’ creature, then create your own stick person to take home!